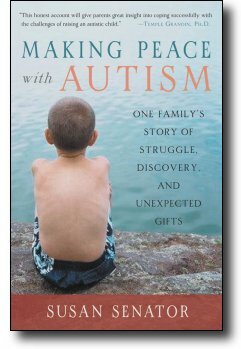 After a great deal of hard work, my wife Susan is going to have a book published this September: Making Peace With Autism. It’s her memoir about our family, and how we have dealt with the autism that afflicts our oldest son. We’re all very excited about the book. I’ve put together her web site if you want to read more about the book or other pieces Susan has written: Susan Senator. Could I ask a favor? Susan’s name makes Google searches difficult. Searching for “Susan Senator” tends to find Senators named Susan, and “Sue Senator” is worse: there are lots of news stories about people suing their senators. Here’s the favor: make a link to Susan Senator to help Google find its way. Dunno if your wife has surfed over there. This is the first I've heard of it. BTW: Thank you to both you and your wife for your stories of the difficulties of raising a child with Autism. I don't feel quite so alone. My 9 year old son was diagnosed with AS at 5yrs and it has been difficult for all of us to deal with the repercussions. Thanks for the link, we hadn't seen wrongplanet.net yet. And you're not alone. One of the things we've learned as part of the disabled community is that we're all a lot less alone than we had thought. There are many people all around us who share similar afflictions, but they can be hard to see. Congrats on the book! I'll put a link to Susan's name in one of my next blog posts. My PageRank isn't quite as high as yours (you have 6/10, which is excellent for a software related blog; mine is only 5/10), but it should help! Actually, for a while there yesterday, her site was #1, but now it's bumped to #2 by a friendly googlebomber. Who can understand the mysteries of Google?